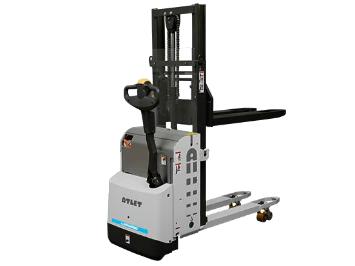 The Atlet Doppio PSD is strong, yet nimble compact pallet stacker for loading and unloading double pallets in and out of delivery trucks. This model features two pairs of forks which allows you to carry two pallets at a time. It is perfect for handling “open” pallets/ load carriers (plastic pallets and bins). The PSD pallet stacker is made to load/unload delivery trucks, handle two pallets at a time, stock pick/ replenish products and travel short distance in warehouses, supermarkets and production areas. It is efficient and able to pick up and put away pallets in confined areas. The Tiller-Up drive option allows the PSD double pallet stacker to work in even tighter areas (turning 360 degrees within a container truck). With the offset tiller arm, the operator easily walks beside the pallet stacker for increased visibility and safety. The ergonomic tiller head is designed for ambidextrous use and features easily accessible controls for fast handling.